The very long day of exploring the wonderful La Verkin Creek Trail will be capped off with a fantastic little waterfall in Bear Trap Canyon. 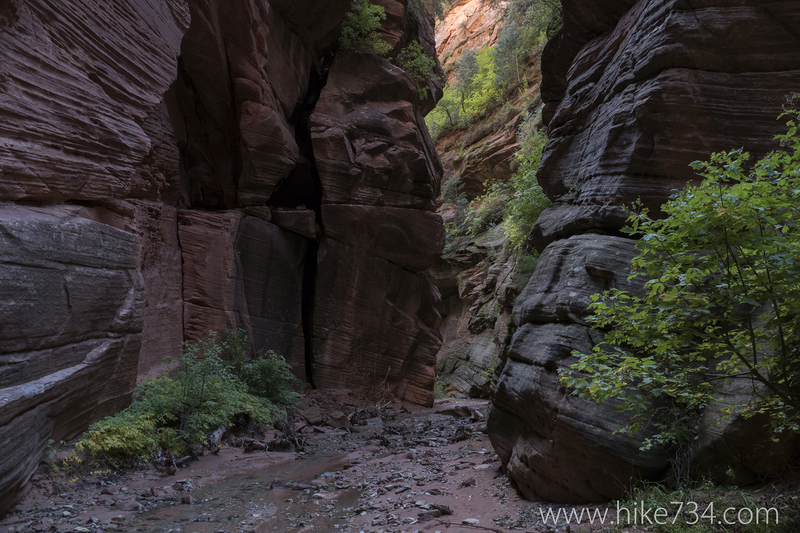 Like most hikes in the Kolob Canyons area, you won’t find the crowds that the main Zion Canyon attracts. This trip can be made slightly longer and even more memorable with a stop up to the Kolob Arch. The first part of the trail is fairly steep as it drops down into the canyon along Timber Creek. Once at the bottom, you walk among cottonwoods and cross the usually dry creek bed of Timber Creek. The trail wraps closely around the impressive Shuntavi Butte, a spire off a ridge of Timbertop Mountain. 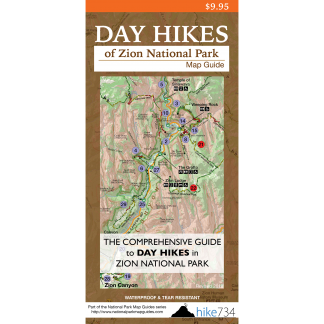 You continue along the creek bottom and pass backcountry campsites 1 and 2, then climb to camp 3. From here you drop down into the La Verkin Creek drainage. Red rock walls surround you as La Verkin Creek bubbles below. Follow the creek upstream on a trail that alternates between hard pack ground and soft sand. The valley walls begin to close in bringing the red rock nearer and making them seem even taller. From here the La Verkin Creek Trail continues uphill to meet up with the Hop Valley Trail which offers another alternative route mentioned below. Continue on the La Verkin Creek Trail for more creek bottom goodness of shrubs, trees, plants, cool rock features, and towering rock walls. Approximately two miles past the Hop Valley Trail junction, you’ll come to camp 13 and Bear Trap Canyon. This slot canyon is easily hikeable for a quarter-mile and feels like a miniature version of the Narrows with towering walls and a flat bottom. The end of the hike and the turnaround point occurs at the cove containing a beautiful little waterfall. Instead of starting at the Lee Pass Trailhead, an alternate option is to start at the Hop Valley Trailhead off the Kolob Terrace Road. This route will shave off a little under a half-mile. The trail here is very sandy with very little shade through a broad valley. Trailhead: Take exit 40 between Cedar City and St. George on I-15. Head east past the Kolob Canyons Visitor Center up the Kolob Canyons Road. Look for the parking lot at Lee Pass with picnic tables. The trail starts on the east side of the road by the interpretive sign and map.